Profound Material Technology Co. Ltd. is China's most respected solder ball manufacturer. 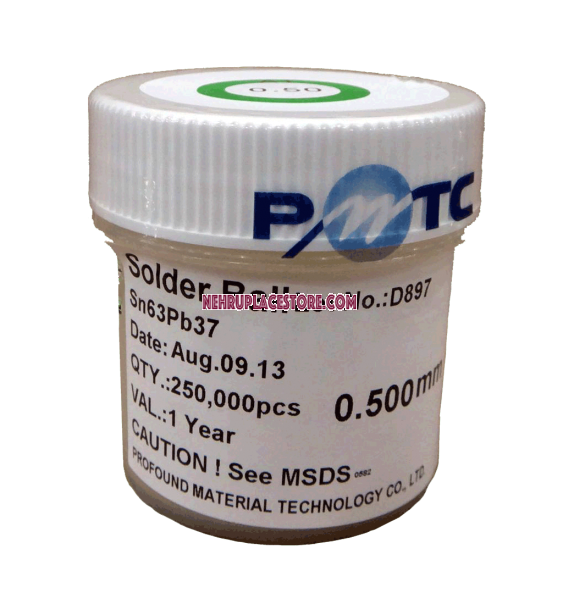 PMTC BGA Solder Balls 0.5mm Leaded Sn63 Pb37. BGA Solder Balls 0.5mmPrice : ₹ 1200.00 + 70.00 Shipping and HandlingCondition : New PackedComposition : Sn 63 Pb37Ball Diameter : 0.5 mmTolerances : +/- 0.015 mmCPK : ≥ 1.33Brand : PMTCQuantity : 250,000Company Info :Profound Material Technology Co. Ltd. is China's most respected solder ball manufacturer. These solder balls are highly respected in the industry Our reputation is your guarantee.